Simply delicious traditional apple pie. I will never win a beautiful pie contest but I'll go up against any pie for flavor, texture and consistency. I like to think of my design as rustic! Over the years I have tried different recipes with varying ingredients or changing up the method and I have had a lot of good pies in my time, but I always come back to the old stand bye childhood favorite recipe that my Mom always made. The ingredients are simple and the list is short and you can't beat it. I always brush the top crust with egg whites and sprinkle sugar all over the crust to make it pretty just like my Mom always did. Mix all the apples together with ingredients and pour into the bottom crust. Brush with egg white and sprinkle with sugar all over the top. Peel and slice the apples and mix together with sugar, cinnamon and nutmeg. 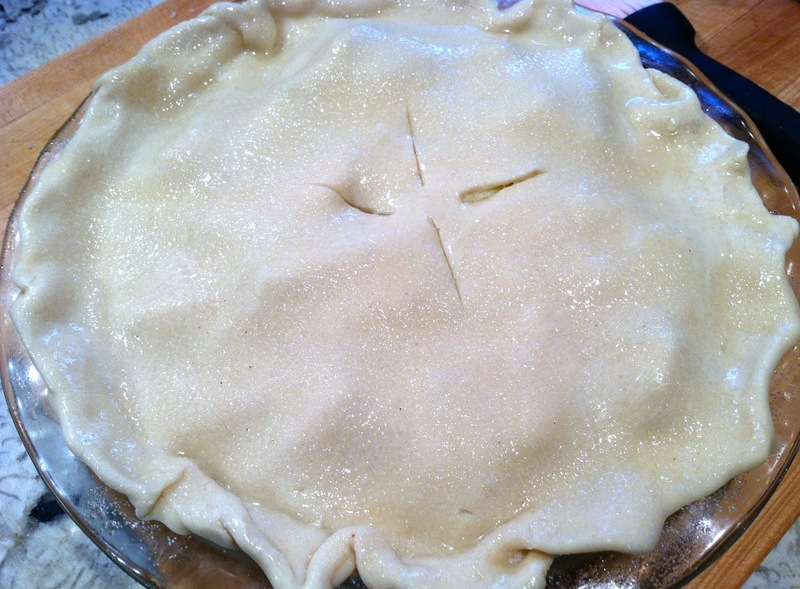 Put on top layer of pie dough. Crimp the sides together and cut 3-4 slits near the center to allow the steam to escape. For a pretty glaze, brush top with egg white and sprinkle of sugar. Bake 15 minutes at 500 degrees until brown. Turn oven down to 350 degrees for another 40 minutes. Serve warm with vanilla ice cream!